Last month, Stanford University’s Center for Research on Education Outcomes (CREDO) released a new study on urban charter schools, which purports to show, for the first time, that charters outperform city public schools, at least on standardized-test scores. If true, the study’s findings are a potential bombshell since, thus far, studies have shown no meaningful difference between charter and public schools. The years I’ve spent researching schools on the ground in charter-heavy districts like New Orleans and New York City made me skeptical of such an outcome. But because I am not an expert in research methodology, I decided to hire a respected statistician, Kaiser Fung, author of Numbersense and an adjunct professor of statistics at New York University who has no connection to the education-reform movement (and thus no axe to grind), to help me analyze the CREDO study. After combing through the study and its accompanying technical document, and after exchanging a series of emails with Macke Raymond, Director of CREDO, we found significant problems with the CREDO study. The problems go well beyond technical quibbles and suggest that any generalizations drawn from the study about the quality of traditional public schools relative to charter schools would be a big mistake. In particular, the study does a poor job of explaining the basis on which it includes or excludes charter- and public-school students; an email exchange with Raymond clarified the study’s methodology, but also revealed that it introduced, in many cases, an anti-public-school bias. And, in at least one case—the findings on New Orleans, the first all-charter district in the country—Raymond admits that CREDO violated its own methodology, a fact not disclosed in either the study or its accompanying technical documents. The study also relies on a controversial methodology that the researchers used in past CREDO studies and that has been critiqued here and here and here. What’s important to know about the methodology is that it purports to compare each charter student in the study to a “virtual twin,” a composite of as many as seven public-school kids who attend “feeder” schools and who “match” the charter students on both demographics and test scores; the virtual twin is literally an averaged kid. The demographic criteria for creating each virtual twin includes: grade level, ethnicity, gender, Title 1 eligibility, special-education and English-language-learner status. To test my theory, I contacted two of the better Title 1 middle schools in New York City whose demographics I knew would mirror those of local charter schools to see if they meet the criteria that would qualify them as charter “feeder schools.” Global Technology Preparatory, in East Harlem, where most kids are black or Latino, estimates that it has sent only three of its graduating eight graders to charter high schools over the last three years. West Side Collaborative, a ten-year-old school with similar demographics, hasn’t sent a single transfer-student or graduate to a charter school, according to Jeanne Rotunda, the recently retired founding principal. Both schools received an “A” and a “B” on the last two graded report cards from the New York City Department of Education, and are given high marks for quality from parents, students and teachers. Yet, although both GTP and West Side have charter-like demographics and are in an area rich with charter schools, they would not count as feeders and, therefore, their students wouldn’t be included among the virtual twins in the CREDO study. This also raises several further questions: The study’s geographical filtering mechanism for determining which schools qualify as “feeders” isn’t disclosed, except for some qualitative description in the Technical Appendix. It would have been much more straight forward to rely on simple geographic or district demarcations. New York City, for example, neatly divides its schools into clearly defined neighborhoods, such as East Harlem North and East Harlem South etc., as well as distinct educational districts. Global Tech and West Side Collaborative also highlight the ways in which CREDO’s matching criteria miss critical differences between public- and charter-school demographics. Urban public school students are often poorer, more likely to attend schools with large number of kids with special needs and English language learners than their charter-school counterparts. They are also likely to have parents who are less engaged, for a variety of reasons, than those in charter schools, which target the most engaged families via everything from lotteries to requiring that parents attend a set number of open houses before they can even enter lotteries. These distinctions are not addressed by the CREDO study. The reverse problem—too many potential public school student matches per charter student—plagues the study’s findings in cities like Boston where a very small percentage of students attend charter schools. See below. Problem Three: Subjective decisions on which charter schools and public schools to include or exclude introduce a number of additional anti-public-school biases. The study includes both selective and non-selective charter schools, but eliminates an undisclosed number of demographically similar public schools as per above, again introducing the potential for anti-public school bias. Among charter schools, the study eliminates only those that operate in “secure” settings, such as detention centers, as well as “charters that are permitted to use entrance exams (these occur only in two of the regions, a total of 4 schools, I believe),” writes Raymond in an email. “Other than these exceptions we include all TESTED charter students.” Again, this detail is not available in the study or its attendant technical documents. However, when a public-school student transfers to a charter, the entire record of that student is deleted from the virtual-twin control group. At the same time, she is eligible to be included in the study as a charter student. “This is doubly bad,” says Fung. Here’s why: The public-school student who is transferring to a charter is presumably a good student. By deleting the record of this student during the time she was in public school, the study drags down the performance of the public-school matches during that period. Simultaneously, because this student can now be considered a charter student in future periods, and can be counted as part of the charter student population in future periods, she contributes to the performance of the charter students in the study. Says Fung: Her answer amounts to “because we don’t have data, we don’t know if there is bias, and because we don’t know, we assume there isn’t”. The reality is the students are dropping out whether or not CREDO sees them. This is known as “survivorship bias”. 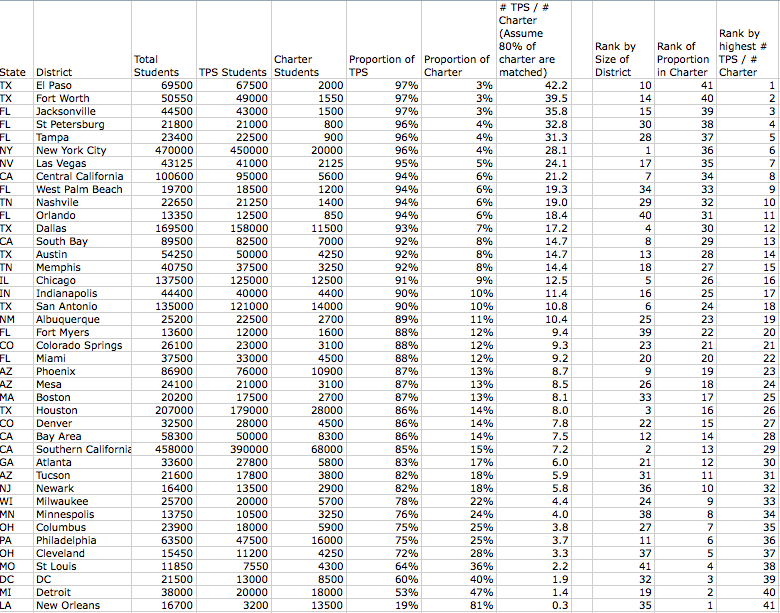 All CREDO gets to see in the data are the “survivors”, students who have not dropped out of the system. Imagine a clinical trial comparing cancer drug A and cancer drug B. You measure the increase in survival time of patients in each arm. Now, suppose each time someone dies, you drop them from the study. The problem is that the reason for the dropout is related to the outcome being measured (i.e. their survival time is so low that they died before the end of the study). Similarly, if the students who have dropped out of charter are those who perform worse, then for sure, by letting these students drop out of the study, they have a bias in the selection of the charter student population. This despite a recent study, by the Educational Research Alliance at Tulane Univ., in which principals of New Orleans charter schools admit that they respond to market pressures—in particular, competition for scarce funds that come to schools with the highest test scores—by engaging in “actively selecting or excluding particular types of students.” Such clandestine selectivity may, indeed, contribute to large and under-counted dropout rates in New Orleans. In addition, while CREDO says it uses an average of five public-school students, and a maximum of seven, to form a virtual twin, it never explains what proportion of public-school students in each region are included in the study, a problem that can, again, introduce bias. Fung found numerous other problems, some of them technical, which I will not elaborate here. However, the examples above are more than enough to cast serious doubt on the study’s conclusions. And this, even without further challenging two key assumptions behind the study: A) That standardized-test scores are an adequate measure of school quality and B) That creaming in charter schools does not exist. Finally, readers of the Credo report are likely to think the public-school matches are representative of public-school students in general (which Raymond herself said was not the intention), and to think that somehow a finding here, even if one were to accept CREDO’s methodology, can be used to advocate expanding charter schools. Unfortunately, the myriad problems with this study have not stopped many charter advocates and even some respected journalists from blindly accepting the study’s findings. This entry was posted in Education and tagged Boston, charters, CREDO, CREDO study, education, Education reform, English language learners, Global Technology Preparatory, Harlem, Jeanne Rotunda, Kaiser Fung, Lake Forest, Macke Raymond, New Orleans, NOLA, Numbersense, OPSB, Orleans Paris School Board, public schools, special needs, Title 1, TPS, virtual twin, West Side Collaborative. Bookmark the permalink. Pingback: Our Children are NOT Human Capital! | Wolfessblog — Guillotine mediocrity in all its forms! The ironies are plentiful, for sure. For example, there would not be a Morris Jeff as it currently exists without starting from scratch — there weren’t ANY public schools that were integrated before katrina. Morris Jeff is one of a handful of new charters that have opened in the past few years that are specifically designed to mirror the racial makeup of the city — they have roughly 60% white (middle class) kids and roughly 40% black kids (who are probably closer to middle class than not). Also, there is no more “Katrina money” for schools — it’s all gone. There was a huge influx of money for new charters in the first few years but now, any charters that have a big influx of money are working night and day to get it. Charters are constantly raising money and networking with large donors to fundraise. It’s not really clear how the most disadvantaged kids are hurt…… there was a big study done about school leaders doing things they shouldn’t be doing to weed out certain types of kids, but the enrollment system that’s been in place for 2 years now makes it impossible for school leaders to do that anymore. It’s a moot point. Not sure how I missed this post, way back when. Apologies. Re how the neediest kids are hurt: Lousiana and the LDOE in particular, have gone to great lengths to obscure the numbers that would help us understand, for example, what percentage of ninth graders in a given school make it to graduation, or the percentage of 8th graders who never make it to 9th grade. The state also has very unreliable numbers for kids who drop out. The state auditor has called out the LDOE for its shoddy numbers. The RSD also has acknowledged that it doesn’t do a great job of keeping track of kids; no one is responsible. Thanks for posting and, again, apologies for not responding sooner.